We’ve been wondering for a while what Apple would do to deal with users who went overboard requesting their money back under its new EU-mandated 14-day refund policy. Now we know. Rosyna Keller shared the alert above, which only appears if a customer has repeatedly requested refunds for iTunes Store content. 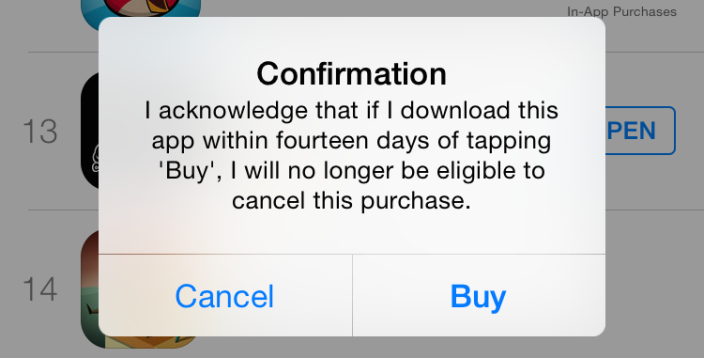 By tapping ‘Buy’, they’re then forced to revoke their right to a refund if they download the item within fourteen days. Apple’s able to take this step because EU law allows companies to remove the right to a refund on digital content as long as the customer is told at the point of download. We’ve contacted Apple to find out more and will update this post if we have any more details.